Nine months before the outbreak of the second world war, and a month before the IRA’s own Bombing Campaign began in Britain, the unionist government once again began interning republicans in Belfast in 1938. Some were to be held until 1945, without trial or charges. On 22nd December 1938, the RUC carried out a series of raids across Belfast, arresting 33 men (plus one in Ballymena). Among those arrested was the O/C of the Belfast IRA, Sean McArdle and many senior republicans, like Chris McLoughlin (the Belfast IRA delegate to the 1938 IRA Army Convention) and veterans like Jack McNally and Joe McGurk. All had been imprisoned on numerous occasions, McArdle having even spent the start of that year in prison. But the raids revealed the stark limitations of RUC intelligence. Most of the IRA staff, including the likes of Sean McCaughey and Albert Price, remained at large. The quality of the RUC operation is also illustrated by the arrest of Frank McGlade. When they arrived at the McGlades to arrest his brother, Charlie (who wasn’t there), rather than returning to barracks a prisoner short, they took Frank instead. As Sean McArdle was interned, Charlie took over as O/C Belfast. Frank was to remain interned until 1945. The Belfast IRA had also known the RUC were coming. They had been put on alert that there was a major swoop imminent in November when a number of customs posts had been blown up on the 28th and 29th (three IRA volunteers, none from Belfast, died in a premature explosion at Castlefin in Donegal on the 28th). Sporadic bomb attacks, mainly by unionists, had occurred almost every month in Belfast in 1937 and 1938. These included a bomb attack on the McKelvey GAA club’s rooms in Rockmount Street in the days before the custom posts were blown up (damaging an adjoining social club and injuring three men). There was also an attack on Brantry GAA club in Tyrone in the week afterwards (on 6th December). Needless to say, despite their ongoing bombing campaign, no unionists were arrested and, again despite the attacks occurring on the border, mostly Belfast republicans were interned. Those republicans who believed they were known to the RUC had been staying away from their homes since the attacks on customs huts around the 28th November. GHQ in Dublin then advised them that it was safe to return to their homes. That was a couple of days before 22nd December. Liam Rice contends that it was later learned that the RUC received information from Dublin to carry out the round-up (in Ray Quinn’s 1997 book A Rebel Voice, clearly referencing Stephen Hayes, the Chief of Staff deposed and court martialled in 1941). The thirty-four detained by the northern government were Sean McArdle, Joe McGurk, Chris McLoughlin, Jack McNally, Joe Boal, Mick Trainor, Oliver Trainor, Dickie Dunne, Billy Watson, Bobby Hicks, Jim Nolan, Frank McGlade, John McGuinness, George O’Connor, Joe Keenan, Joe Cullen, Sam Irvine, Angelo Forte, Arthur Mullen, Jim Campbell, Billy Murray, Gerry Harte and Pat Loughrey. They were taken first to the cells in Chichester Street Barracks then on to Crumlin Road prison. Many were familiar with the grind of routine arrests by the RUC only for it to then be followed days or weeks later by release without charge, mainly under section 23 of the Civil Authorities (Special Powers) Act. On this occasion, though, all thirty-four were served with internment papers in mid-January. 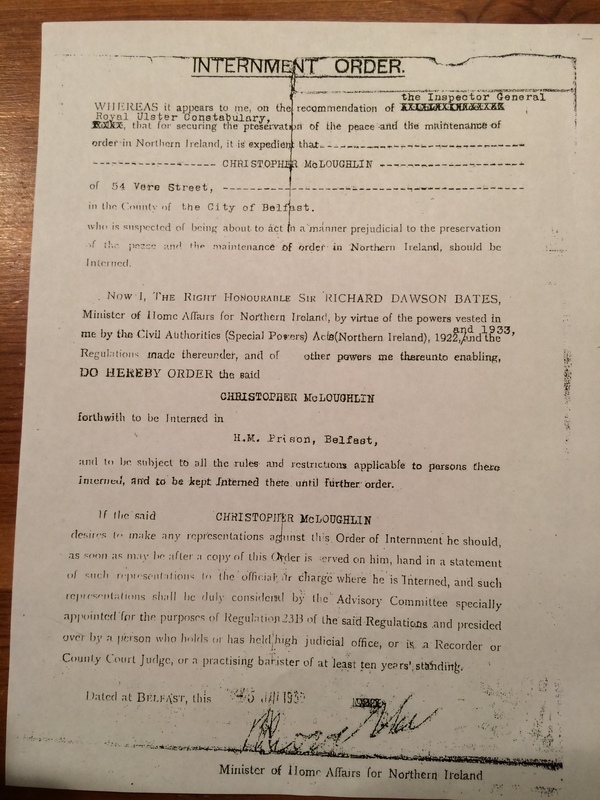 In case anyone was under any illusions, the Minister of Home Affairs in the northern government, Dawson Bates, was making it clear in Stormont in the latter half of 1941 that anyone interned would not get out until the war was over. So most did not get released until 1945 and were to spend time interned in Crumlin Road, the prison ship Al Rawdah and Derry prison where they were joined by several hundred others. The conditions in all three were dreadful. Dickie Dunne, one of the thirty-four arrested on 22nd December 1938, died due to the poor conditions in prison (along with many others). John McGuffin (in his 1973 book on Internment) estimates that the experience meant that 80% of republicans didn’t re-involve themselves with the IRA on their release in 1945. The mortality rate among the prisoners appears to have been a staggering 3%. To put that in context, the mortality rate of the British armed forces in the second world war was 3.3%. To the unionists, unconcerned by fatalities, untroubled by criticism and secure in the knowledge that they were subject to no meaningful scrutiny, internment was a triumph. This entry was posted in 1930s, 1940s, Uncategorized and tagged bombing, Castlefin, Charlie McGlade, Chris McLaughlin, prison, Sean McArdle, Stephen Hayes. Bookmark the permalink. I linked McGuffin in the blog (talking about the attrition of activists brought on by internment in the 1940s).